Leprosy is one of the oldest diseases in the world. The ancient Egyptians wrote about a disease similar to leprosy and it is referred to in the bible. It has been a long-held belief of many cultures across the world as being a punishment from God. For instance, in India, the Hindus considered any deformities resulting from leprosy were divine punishment. 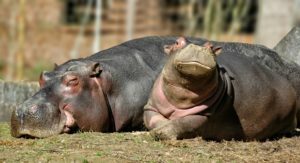 Other cultures believed leprosy was a result of witchcraft, and in some parts of Zambia, hippo meat is rarely eaten due to a local belief that consuming hippo can cause leprosy. Today we know leprosy is caused by a slow-growing type of bacteria called Mycobacterium leprae (M. leprae) and it can be cured by using multidrug therapy (MDT) such as dapsone and rifampicin. However, in the past, snake venom, bee stings, and even sacrifices were considered cures for leprosy. For several centuries drinking or bathing in blood was considered to be a treatment. The Old Testament describes pouring the blood of a sacrificed bird on an affected individual. Later the Swiss physician, alchemist, and astrologer Paracelsus (1493 – 1541) recommended the use of lamb’s blood. The belief of blood being a cure for leprosy continued well into the late 1700s, when the use of dog blood was mentioned as a treatment for leprosy in the publication De Secretis Naturae. Other old journals have described using leeches to bleed of people living with leprosy. Medieval alchemists would sometimes give individuals a concoction containing gold; the belief was gold symbolised richness and purity, and would therefore cleanse the individual of the disease. The book The World of the Castrati, by Patrick Barbier, highlights in the middle Ages, castration was believed to cure or prevent leprosy, hernia, epilepsy, gout and various inflammatory conditions! Thankfully today we know better. If diagnosed and treated early, people will not develop the disabilities experienced in days gone by, and can continue to live normal lives and be a part of the community. Even if a person presents with disabilities as a result advanced stages of the disease, they can still be treated and supported and continue to be a part of the community. The biggest challenge today overcoming the stigma associated with leprosy and educating people leprosy is curable. Kindwitwi is proof stigma can be overcome; once a place of misery and despair, and shunned by neighbouring villages, it is now a thriving community. People living with leprosy are cared for and are a genuine part of the village, and many regional council meetings are held in the village – something that would’ve been unheard of a few years ago.